I made this little card for two challenges, Simon Says Stamp's "Patterned Paper" challenge for Wednesday, and Splitcoaststampers' CAS challenge "Hats Off." I always forget to use the patterned paper from my overflowing scrapbooking stash, mainly because I like working with inks and watercolors on my cards. This paper is a new addition to my collection, Lawn Fawn's Knit Picky 6x6 petite paper pack. For the heart I used Altenew's Halftone Hearts Nesting Dies which I bought myself for Christmas! 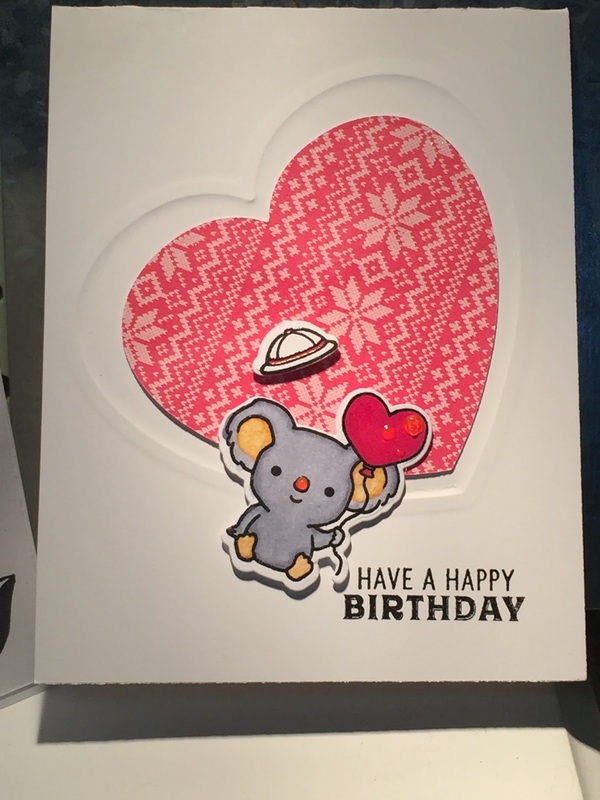 The cute little koala was from a limited edition from Sugar Pea Designs that Simon Says Stamp offered back in the fall (sorry!). I stamped with Versamark onyx ink then embossed with clear embossing powder before coloring in with Spectrum Noir alcohol markers. Then I cut them out with the matching dies (I've been obsessed with die cutting lately!) and popped them up with some foam dots. The sentiment was also stamped and embossed. Finally, I just had to add some bling with a couple Nuvo drops and Wink of Stella sparkle, that unfortunately doesn't show in the picture. I didn't have any red Nuvo drops, but, voila, the clear crystal ones absorbed the red from the alcohol markers, a happy accident! an adorable card, luv the sweet heart! I am so glad you played along with us at simon says stamp wednesday challenge!